Learn more about the effect of seasonality on estimates of school effectiveness and how ignoring summer loss can impact which schools are identified as low performers. In this report, Collaborative for Student Growth researchers examine the implications for using short-term and long-term estimates of student growth school in determining school effectiveness ratings. In this full report, Collaborative for Student Growth researchers investigate the effect of seasonal shifts in student growth on school effectiveness estimates. View status and growth norms for both schools and students in math, reading, language usage and science. 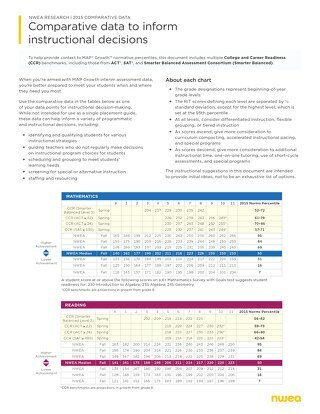 Consult our comparative data guidelines for assistance with screening, placement, readiness, and other instructional decisions.